The Pennsylvania Turnpike Commission is facing an $11 billion debt load and a lawsuit. Mark Compton, CEO of the Turnpike, said a law passed by the state Legislative more than a decade ago is to blame for part of the debt. The law requires the Turnpike to use toll money to pay PennDOT $450 million per year for highway, bridge and mass transit projects. Just wondering...from a legal standpoint, is the Turnpike actually the correct party to sue? After all, they're obeying the law. Wouldn't the State be the correct party to sue? What are the current odds that the PA assembly will extend the 2022 cutoff? 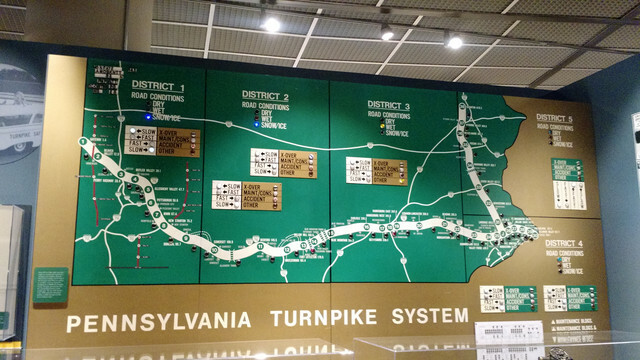 I've been digging through some of my photos from a few years ago and found a bunch of photos I took of the PA Turnpike exhibit at the State Museum of PA in Harrisburg. A while back I posted a photo of the PA Turnpike status board, which I think is now gone because my old image host decided to disable hotlinking, so I'm reposting it here. They also had a picture of an old "Exits" sign. ^ I was at the State Museum last weekend—the PHMC was hosting special events for the 338th anniversary of the chartering of Pennsylvania. I hadn’t been to the State Museum in about a decade, and I was surprised at the size of the current Turnpike exhibit—which was to the best of my recollection almost nonexistent ten years ago. In addition to the system status board shown above, the exhibit also includes an original, gleaming blue 1940 toll booth complete with a 1940 Packard in the lane and uniformed PTC agent handing over a ticket with a smile, a roughly ’70s/’80s-era ticket dispenser, a collection of old toll tickets, a call box, a scale model of a Sideling Hill tunnel portal, and lots of other artifacts, documents, and photographs. And the collection includes what I presume is an (perhaps the?) original YOU Slow Down sign with a stern finger pointing directly at you. I was pressed for time and didn’t get to take any photos, but I’d like to go back again soon for a better look. Notice the shield for U.S. (now PA) 230. 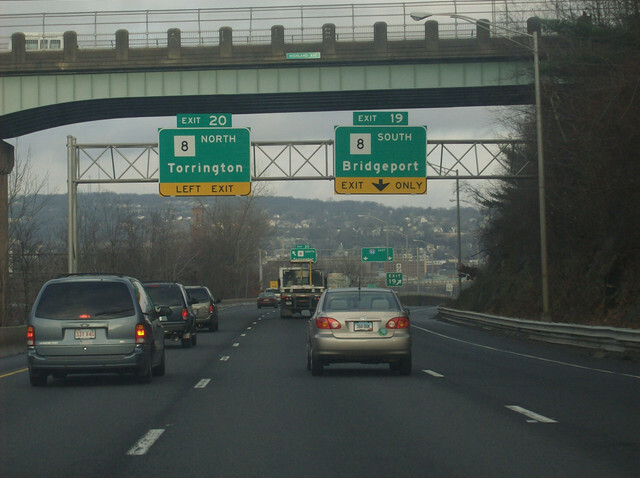 The PATP may have been the first superhighway to use route shields on exit signs. Were route shields used on the Middlesex to Irwin segment in 1940? When did the PTC switch to green exit signs? 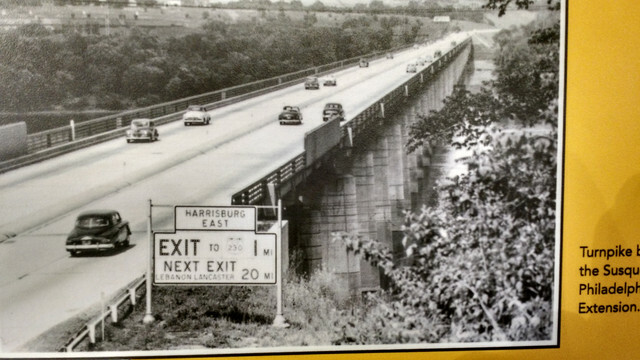 Something I'm curious about is whether PA's seemingly unique former practice of centered exit tabs came first from the Turnpike as seen in this photo. Hardly unique. Maaaaany other states did that early on. Connecticut did it for many, many years until recently. Oh, I thought that was mostly a PA thing. ^^Center-justified exit tabs used to be SOP under the MUTCD. Interesting that the photo in the article is of a New Jersey Turnpike toll plaza and signing . . .
At least one of the comments/commenters below the linked-article stated the same thing. The entire press conference can be viewed at https://www.pscp.tv/w/1gqGvnQpakOGB. Changing subjects, to the ongoing route 283 reconstruction around the PATP, does anybody know if Penndot is lengthening the PA 283 bridges over the Turnpike to allow for the (far) future widening eastward from the new Swatara Creek bridge? It didn't look like they did anything more than rehabilitate the bridge when I drove through this weekend. Also, I noticed the PTC is installing a new system for two-way operations at the Tuscarora Tunnel. Starting about a mile before the tunnel, they have installed concrete barrier on the left side with automated swinging barriers. They are orange semi-circle barriers with black-on-orange chevron symbols. I'm guessing the purpose is to keep traffic from being in the lane that will handle oncoming traffic inside the tunnel. It'll be many years if not a few decades before the PTC finally gets around to this stretch because of its low volumes, so it makes a bit of sense. I'm sure if they were totally replacing it, they'd make it long enough for six lanes on the Turnpike. Officials take steps to clean the PA Turnpike. PA Turnpike declared cleanest highway in America. PA Turnpike closed between Downington & Valley Forge due to crash involving truck filled with soap. When will it dawn on you all to dial down these posts. Wanted to ask: With all the financial word at the PTC, will there be any new mainline improvement projects coming up? I know the plan was for a full rebuild around US19 and the Freedom Road Bridge project. But I see no reals signs of life over at the website. Either the article or the judge herself didn't go into too much detail about the decision. Also, a plaintiffs’ lawyer says they’ll appeal.